Summary: Bolivia is a very poor country; nature on the altiplano is grand, but cruel and unforgiving. The colors in this arid desert defy belief, and the volcanoes are among the most beautiful I have seen anywhere. Two major attractions had lured me into Bolivia: The Salar de Uyuni and Lake Titicaca. Riding in Bolivia is hard; there are only a few paved roads, and it felt like the salar and dirt tracks were the most remote and inhospitable places I have been to by bike. In Bolivia was the only time on my trip that I got sick to my stomach, which made it necessary to rest for a few days in La Paz. While there I joined another expedition planning to climb Nevado Sajama the coming weekend. Unfortunately the weather was horrible with too strong winds and snowfall as well as a relapse into my bad stomach preventing us from reaching the summit. La Paz is a bustling and stinking metropolis, but a fascinating place nevertheless. Climbing up to El Alto in blue-grey smog was probably not the healthiest thing to do on my trip, but it made me appreciate the deep blue waters of Lake Titicaca that same evening all the more. A final highlight is the little port town of Copacabana, where one climbs above the town to watch mesmerizing sunsets that make one forget that one is not in the other Copacabana. From here the road continues along Lake Titicaca into Peru. Crossing the Salar from Colchani in the SE to the Volcan Thunupa in the N and back to the Isla Incahuasi in the center of the Salar. Wonderful views from the Isla with its 1000+ yr old and 10m tall cactus trees. Back across the Salar chasing our own shadow until sunset. I get up at 8am and have breakfast again at my hostel. Then I start packing and also buy water and a few things to eat. Since I don’t know where I’m going to end up for the day I pack a total of 10l water and Coke – don’t want to run dry too quickly! I also get some more cash as the next couple of days will be fairly remote. I leave around 9:45 and follow the same road out North to Colchani which we took yesterday. It’s better to cycle on than I thought; after 1.5 hrs I stop in Colchani for some chicken soup for lunch. Then it’s on to the Salar: First about 5km to the West to where they collect salt and shovel it onto trucks who bring it away. Then I turn North heading towards the volcano Thunupa in the far distance. I follow some tire tracks to have a bit smoother surface. Initially that works well, but after a while those tire tracks fan out in different directions and I need to decide which tracks to follow. The surface of the salt differs; it ranges from fairly smooth and dry to bumpy and wet. I also have some headwind to deal with, so my speed is only between 10-14km/h. Then I see another rider to my right and our paths converge. It turns out to be a local who rides to his workplace out on the Salar where he is cutting salt blocks! His single speed bike is very different from mine and he has his salt cutting tools strapped all over the bike. He is quasi mummified in a hat and shawl as protection from the intense sun. I think rarely did two cyclists meet who were more different than the two of us today! The tracks end at a little shack in the middle of nowhere; this reminds me of ice-fishing huts on frozen lakes in Minnesota in the winter. I cut diagonally NW across the salt in hopes to connect with some tracks again. This is slow going and bumpy, but soon I am following some well-defined tracks again. I stop every 1.5 hrs or so to re-apply sunscreen and lip balm for protection, as well as to drink some Coke and eat a snack. The volcano hardly appears to get any closer. Soon I am surrounded by many km of white salt in every direction. It is a great scenery to be in the midst of, somewhat unique in these dimensions! 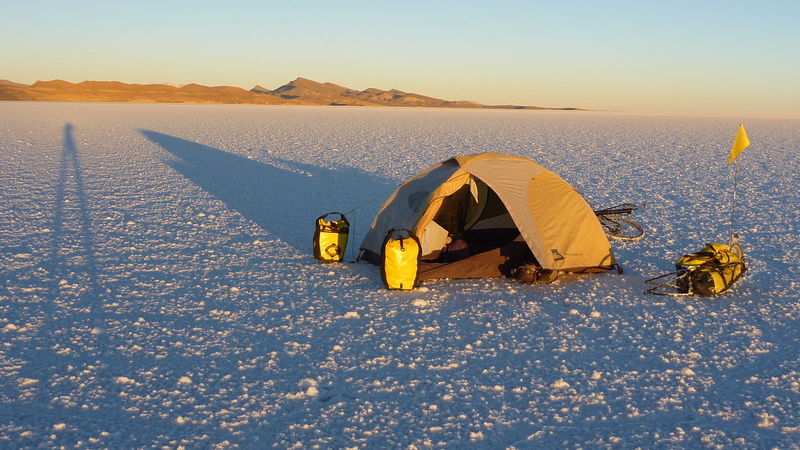 At 4pm I realize that I won’t make it to the other side before sunset; however, I want to camp out on the Salar anyway. So I decide to ride until 5:30pm, a 1/2 hr before sunset. At that time I stop and set up my tent for the night. I send my SPOT-Ok message and take many pictures of the sunset with its gorgeous colors. Then I eat some bread, cheese, nuts, fruit and cookies for dinner. After eating I transfer all new photos to my laptop, back them up to the SD-card and external harddisk and watch them on the computer screen. In the meantime it got dark and there is a fantastic night sky opening up overhead: I can see the Milky Way and the Magellan clouds very clearly; there is no artificial light out here whatsoever. In fact, other than one small dot of light on the Northern horizon there is no sign, sight or sound of human presence at all. I am in complete solitude out here and there is no sound whatsoever – total silence! I brush my teeth and type these notes. Into the sleeping bag by 8pm as it gets pretty cold out here. What a great place to spend a night! I get up at 7:30 with the sun shining brightly on my tent. It’s still cold outside – overnight it was -3C in the tent – but the intense sun is warming up the morning air quickly. I eat a small breakfast and then pack away my tent. At 8:45 I start riding. Like yesterday I continue cycling on the white salt with nothing much to look at, except the surrounding mountains in the distance. At one point I see a dozen Flamingos flying in my direction across the Salar, a beautiful sight. Then I notice a black object in the distance and follow the tire tracks towards it. Turns out it is a truck tire marking one exit off the Salar. Since I’m not sure whether I can leave the Salar further North I take this track to exit here. deep sand which I can’t ride on; I need to push the bike many times today. My first pueblo is Sajsi; there are some folks there working on the Quinoa harvest. This region is famous for growing Quinoa; I have never seen before how the plants grow and how the harvest process works. So this is quite educational. I also buy some Coke and inquire about food. I also inquire about the road ahead and get various answers for direction and distance. The road is pretty bad, at one time across a saddle and down over big rocks. And more deep sand, crossing rivers, very slow going. I reach a small village called Candilaria de Biluyo. There is some festival going on and I am invited for lunch. I am treated to soup and a big plate with quinoa, potatoes, salad and meat. When I ask what I owe them they just shake their heads and say I’m invited! Very friendly folks, they even insist I drink a glass of the local Huari beer! With full stomach I continue around 3pm; but prior to leaving I use the water of the village fountain to wash more salt off my bike. Then I continue across some grassy flats; a few days ago you probably couldn’t have passed here as the rain turned everything into mud. Now, however, this stretch is actually quite good. Unfortunately the road I’m following turns way West, and it is a very bad road with lots of sand. I actually crash twice today, and once I fall on my back such that it hurts when I continue riding! This road is also very bad for the equipment and I am concerned how much more of this beating my bike can take. I reach a little place called Challuma around 5:20pm and consider stopping there (as they have a soccer field with flat grass). I decide to continue a bit more as now the road improves slightly. I cross a small saddle around a little peak and reach another village called Cajhuata. Luckily there are a few flat grassy spots so I can set up my tent as it gets dark. A few friendly folks approach me and we chat. After I’m done setting up my tent they invite me to their house which also has a little shop for basic groceries in it. I unpack my remaining food and we share with some of our joint food for dinner. Into the sleeping bag by 8:30pm. Two things keep me going these last two days: Plenty of food, and plenty of rest. Last night on the Salar was exceptionally quiet; not so this night, with the village dogs barking in concert every 2 hrs or so and then they start a truck at 4:15am to warm up it’s Diesel engine (which also caused a slight exhaust smell in my tent even though more than 50m away). Just before dawn I measure -8C in the tent. After sunrise at 7:10am it warms up quickly, though. Half of the village people come out to check out the tent. They greet me with: “Buen Dia. Frio?” I guess not too many tourist, much less cyclists pass through this little place, much less sleep right there in a tent! For breakfast one man even brings me hot coffee out to the tent, and I am invited since last night at Roger’s little place. After a second cup of coffee I pack away the rent and start riding around 9am. First I need to get to Tambo-Tambillo onto the main road to the East. I was told that it’s only 10km, but I know that distance estimates vary a lot. Turns out it’s 25km and I need all morning to get there. At first the road is a little better and unlike yesterday I can roll along with similarity to actual cycling. But then the main road is in very bad shape and reduces my speed and shakes and rattles everything! I crawl towards Tambo-Tambillo and have a short break for a snack. Right after this village the road climbs up 100m over a ridge. It’s very hot and borderline unrideable with all the rocks and sand on the road. There is a great view of the altiplano and some snowcapped peaks on the horizon, but my morale to cycle on such poor roads is now at a low. Just when I needed a break from the bad road there is a newly built track on the downhill, some of it even freshly paved! I cruise down at 50km/h, giddy with the sudden smooth ride and speed! Of course this doesn’t last long, and sections of new constructed track mix with the old gravel track. Generally the new track isn’t opened up for traffic yet, but cyclists can push their bikes up and down the embankment and enjoy the smooth track. Many times one has to get around obstacles such as unfinished bridges or hill cutouts, but it’s still a great boost for morale and average speed. After several hours of this I cross a river which actually has a bit of running water in it: It is the Marquez river feeding the Lago Poopó to the North. Shortly thereafter the road climbs up to the hilltop village of Quillacas – probably the nicest pueblo I have seen these last couple of days with sweeping views of the surrounding altiplano. I now have 2hrs of daylight left, with somewhere around 35km to go. Luckily the new road continues so I can maintain a speed around 20km/h. One can already see Huari at the base of a tall mountain to the East (Cerro Azanaques, 5012m), but it still seems like a long ways away. While very beautiful, it’s now a race against time and sunset. From road construction workers I get information about the remaining distance and figure I’ll be at most 5km away from Huari at sunset. Anyway, too late and cold to do much about it, I order two dinners in a row, each a vegetable soup plus a plate with rice, potatoe, egg, salad and a piece of meat. At 10 Bolivianos ($1.30) this must be the cheapest dinner of my entire trip, so even double dinner doesn’t break the bank here. Lastly, going for a short walk, but everywhere I ask I get the same answer: No Internet in Huari! (I was hoping to get online again after now 3 days off the grid!) typing these notes and to bed by 9pm. At 10:30 I start the ride in shorts as it is warm enough with the intense sun from a cloudless sky. What a delight to ride on a paved road again! And with shoulder and little traffic, no less! Finally I can watch the scenery instead of focusing intently on the next few meters to avoid the next rock, pothole or sand trap; cycling is fun again and I greatly enjoy this mostly flat part. After just 12km I reach Chalapata, a slightly bigger town than Huari. Perhaps they have Internet access here? And at last, I find an Internet place – after 4 days off the grid, so to speak. I spend the next 2 hrs reading and sending email, updating my Blog and creating a new SPOT tracking page for the Bolivia ride. While my loved ones know from the SPOT where I am, it still feels good to send them email how I’m doing and also hear from them again. At 5:20pm I reach Poopó, my goal for the day. At first sight not a very nice place, with mining operations going on, right next to some ruins as tourist attraction. I get to a central intersection, park my bike and sit down in the last 15min of sunshine to enjoy some cookies and water. Right along the streets are several vendors of food for dinner – fish, Llama meat, chicken – I decide for the latter which looks the best. Again, the food is so good and my appetite so strong that I order two dinner plates in a row – struggling to finish the second, even bigger serving. Then I’m invited to Coke by some locals who join me in the little dinner shack – a very nice gesture of these curious and friendly folks. Unfortunately the baths are all closed for the night, so I have to wait until tomorrow morning. Since at the only alojamiento there is nobody answering the door I ride around a bit to pass the time and maybe try later. I come by a police station and the two guards are curious about my bike so we talk for a while. Then they spontaneously invite me to stay in their building for the night; just like with the firefighters in Nicaragua and Panama… So I pitch my inner tent on the floor on the first floor of the police station in Poopó – certainly feeling safe at this place. Friday, May 7 – 1 year after the start of my trip! Mostly flat distance, unfortunately 15km/h straight on headwind! At 25km I pause at Machacamarca in the shade of a large tree. 20km prior to Oruro I meet Leo, a cyclist from Quebec who is just patching a hole in his tube. 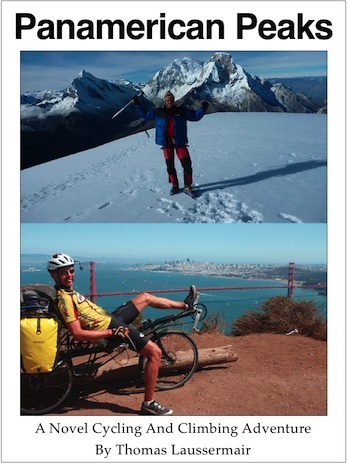 He is heading South towards Patagonia and also towards winter! We chat for a little while and then part ways. Oruro’s first impression is that it’s a dusty, stinky place where people drive aggressively. Perhaps it would have been better if not approaching from downwind, but I got a lot of bad industrial smells cycling into town. Taking a room at Hotel Monarch – need a hot shower and a clean room for a change! I get up around 7am for a hot shower and (disappointing) breakfast. I want to start riding early as it’s going to be a long day, buy not too early as it still quite cold in the mornings. So I leave the Hotel Monarch in Oruro around 8:30am. First I have to deal with 4km of cobblestones on the Avenida La Paz, whose name indicates where it’s heading. Traffic is moderate, the air is still quite cool in the shade, and soon I reach a golden monument marking the end of town. Beyond that are long, flat straight roads sections leading North across the altiplano. Unfortunately I have headwind again, just like coming into Oruro. This will make the day probably 1 hr longer and harder to ride. I stop briefly at 20km for a drink. At 38km I reach the town of Caracollo, where the main road from Cochabamba to the East comes in. Funny detail: About 500m before the town is a sign stating Caracollo 37km! This sign belongs to the end of Oruro, some 37km further South! I stop for brunch; due to the small breakfast I am quite hungry already. Again, a really decent two-course meal for under $2. I buy some mandarines at a local market sprawling next to the road. Then the next 20km or so are pretty tough: headwind and slightly uphill, a bad combination that makes for frustratingly slow speed. Perhaps it’s also the altitude of up to 3800m and the full stomach. If only I was going the other way, downhill with tailwind – well, one can always dream! Then the road levels off a bit and at 70km I reach the village of Panduro. I stop for Coke and mandarines. Also, I spread out the contents of my little daypack which got wet at the last stop, when I put the backpack on top of a barrel of water; turns out it was not a solid top, but full of dirty water which I mistook to be a metal top… definitely one of the Duh moments! Beautiful sweeping views of the altiplano and the road ahead, but also somewhat increased traffic. After the break I continue to ride over some hills and unfortunately into the wind. Often I find myself doing the calculation in my head what minimum average speed I need to ride to get to my goal by sunset. It’s not quite as tight today as it was back towards Huari, but I also hardly take any more breaks so as to not run out of time in the end. In Sica Sica I decide to go all the way to Patacamaya as it’s less than 20km remaining and the latter seems like a bigger village, hence a better chance to get a decent hostel and Internet access. I do stop one more time when I can see Nevado Sajama on the Western horizon. Despite being about 150km away one can clearly see how this volcano rises above the landscape. At the end there is some downhill and I get to Patacamaya by about 5:40pm, 20min prior to sunset. This gives me time to search for accomodations. After getting up early (6:30am) and shower and shave I have breakfast from 7-7:30am. I want to get an early start as the beginning will be tough and I don’t want to run out of time at the end at Lake Titicaca. I roll out of the Hostal and have to navigate some steep cobblestone streets. Due to the metal cleats on my bike sandals I slip on the cobblestones and feel like running on ice with tennis shoes – completely inadequate! After 1 km or so I connect with the main autopista, which now goes 12 km uphill to El Alto – some 400m vertical. Thankfully it is cool, so at least I’m not sweating like crazy. But the air is often extremely bad due to the Diesel trucks and buses competing with little mopeds as to who can create the most stink. These 12 km have to be among the most unhealthy ever – similar to climbing up to Guatemala City. At times the air is so bad that I need to stop and catch my breath and wait for the Diesel smog to disappear. Some sections are about 5%, the average gradient is 3%. It’s hard, but after 1.5 hrs I reach the top and take several nice photos of the big city below with the high Cordillera peaks behind. Ok, that first part is done! El Alto isn’t exactly a scenic place. In my German bike book they don’t mince words when they describe it as follows: “El Alto ist ein lautes, stinkendes Dreckloch, das man am besten schnell wieder verlaesst.” Ok, so that’s what I’m trying to do, but first I need to buy some Coke, as I hadn’t bought anything below so as not to have to haul it up – I was very thirsty, borderline dried up. The next 15km or so are slight downhill so the bike is rolling comfortably again. Then finally out of the city and a bit less traffic. Also beautiful views of the Cordillera Real to the East with impressively steep and icy peaks. Unfortunately headwind again, just like the last 3 days I had been riding on the altiplano, always wind from NW! This part of my trip would have definitely been easier going the other way, North to South. I continue to Huarina (75km) and from there heading more W towards my goal, Huatajata (90km). Near Huarina I can see Lake Titicaca for the first time – it is beautiful, the deep blue water contrasting against the yellow fields (harvest time). Also there are some Eucalyptus trees and a very clear air – it all reminds me a lot of our day-trip from Puno to Isla Taquile. I pause to take pictures quite a bit. Unfortunately on this section I start to cough a lot – perhaps a result of the bad air I inhaled during the morning climb. I hope this cough won’t stay with me for long. Then I reach Huatajata at 4pm with plenty of daylight left. The first stop is at a museum of a Bolivian reed boat builder, Paulino Esteban. This old man (now 79 yrs old) shows me the museum and proudly displays various artifacts. Among others, he had built reed boats for Thor Heyerdahl and constructed the boats for the RA I and II expeditions as well as several others. Some of the National Geographic articles he displays go back to 1971, almost 40 years, when he was half as old! Pretty impressive! One of his sons takes a photo of me on my bike with Paulino against the backdrop of a huge reed boat they have constructed which will be picked up later this week and trucked to the coast at Arica, Chile. After this impressive visit I look for places to stay. I roll back and forth as there is no well-defined village center – just spread along the lake shore. I stop to check out the highest Yacht club in the world, but unfortunately it’s closed. Then I find a little restaurant / hostel with a nice dining hall right by the lake. There I check out the rooms (so so) but then am offered to camp right on a small grass place next to the restaurant. This place is ideal: Away from the road so passing traffic can’t see me; in a private compound with fences, so safe by night; right by the lake shore, with birds and small waves being the sounds of nature to lull you asleep. And all for under $3 the night! Then I order a trout for dinner and go buy some groceries in the meantime. When the trout is served, I unfortunately begin with the salad and overlook a very hot orange pepper in the tomato salad; that thing burned my tongue and caused me to sweat for 10 min during which I couldn’t appreciate the meal. Only towards the end could I taste the trout again, very yummy! All the while there is a beautiful color display going on outside my window with sunset over Lake Titicaca, it’s a spectacular place, but I’m the only guest, almost spooky so quiet. After dinner I sit for a while and type these notes. They show me where the light switch is and hand me a lock to close the place down once I finish and am ready – very trusting folks. I’m quite happy with this day – a bit shorter than I thought, but hard nonetheless (more than 6 hrs for a bit more than 90kms), and with a very nice ending. Lake Titicaca is really beautiful, just as I had expected and hoped for. Drying up tent which had a lot of moisture and a bit of ice on it. Breakfast at the same dining hall with beautiful views of the lake. Start riding at 10am. Quite warm in the sun. First significant hill (200m) prior to Tiquina. There sweeping views of the Lake with Cordillera Real in the distance. Rolling onto a barge at 12:00pm noon just as they are about to leave with a truck on board. Nice crossing, while eating a snack and taking pictures. Some rest on the other side, then continue with climb of maybe 200m. From here almost level road, with panoramic views of both sides of the Lake. This I think is the most scenic stretch of road anywhere on my entire project, just gorgeous. I stop frequently to take pictures and just enjoy being here. After a first little pass at 4055m some downhill, but then another big climb up to 4251m – my new personal highpoint with the bike. Long descent towards Copacabana, with more photo stops. Check in to Hostal Sonia and then explore Copacabana by foot. Cathedral and the Calvario hill for sunset views and photos. Back down for Internet and then Tuna salad and Pizza. Good night rest of 9hrs. What a day! I just got to Puno, after 140km, a very long day, crossing from Bolivia to Peru and riding along Lake Titicaca for a while. In the beginning riding was nice; lots of harvesting going on along the Lake shores, sweeping views East across the Lake, good road and moderate traffic, even slight tailwind! Things turned worse after Llave (50km prior to Puno): There was a 25km construction area with gravel on top of a rough surface (and passing trucks sending the gravel flying), and due to limited daylight I couldn’t take a break for the last 3-4 hrs or so. Then there were some thunderstorms in the area and I was concerned I would get rained on. Once about 25km before Puno I got some raindrops, but the main cloud was over the mountains, so I was lucky. Then I got to within 5 km of Puno and it got really dark and low black clouds. I could see the bay of Puno already. Riding around the bay to the town center would have been another 5km or so. Then a thunderstorm let loose, with stormy winds blasting all kinds of dust and dirt in my face; riding the last 2 km was extremely cold and hard. It was about to start raining heavily, when I noticed a large building on the left – a 4-star Hotel (Jose Antonio). To seek shelter from the starting cold rain I moved in there with my bike. Those people were stunned – they had not seen a bike like this before, much less a biker in these weather conditions. So they allowed me in and moments later it started raining very heavily – I was so lucky to get here dry! At the reception I think they took pity on me. First they mentioned a room rate of $100, which was about half of what they had on their price sheet. I said – still exhausted and trying to catch my breath – that I had’t spent that much for all of last week in Bolivia. Then she checked in the back and came back with an offer for $70 / night, which I accepted. This is pure luxury here, with Internet in the room, very nice bathroom, big towels and all toiletries, two double beds, and a view across the entire bay which is just stunning. I just took a much needed hot shower – I had gotten really cold in the push to get here through this weather. Now I warmed up and life is good again.